My Art Philosophy Cartridge never leaves my Cricut! It seems every card I make, has some details from the Art Philosophy cartridge. The snowflakes, banner and circles were all cut with the Art Philosophy cartridge on this card. All supplies by Close To My Heart. The snowflakes, circles and banner were all die cut. Have I mentioned how addicting the challenge blogs are???? This card has a lovely wintery feel!! I love the snowflake and bling!! Pretty!! I love the added bling and the designer papers you choose. This is one beautiful card the colours and design are truly wonderful thank you for joining our challenge this week at DDSB. Awesome die cuts and the love the snowflake. Thank you so much for sharing your wonderful creation with us at 4 Crafty Chicks. Beautiful card! 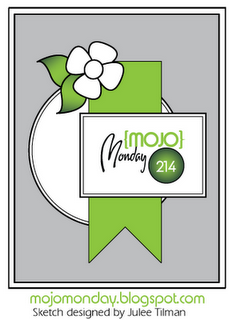 Thanks for playing Mojo Monday! !